It’s so easy to pick up the phone and order takeout from the Asian place around the corner. Mr. Bacon and I used to do it all the time before we moved out to the country. The restaurant was literally around the corner so it would take about 15 minutes from the time we made the call till the time the delivery guy was knocking on our door. While it might be a simple way to put dinner on the table, it’s not really cost effective and you’re more likely to cave and get something deep fried. Instead, try this recipe out. It packs a spicy, sweet and savoury punch, takes about 10 minutes and is crazy cheap. Thanks to Lizzy Writes for the recipe. In a large skillet, brown the ground beef and garlic in the sesame oil. Drain most of the fat and add the remaining ingredients except for the green onion. To make it really quick, use pre-minced garlic and ginger in a jar. Simmer for a few minutes to allow the flavours to marry. 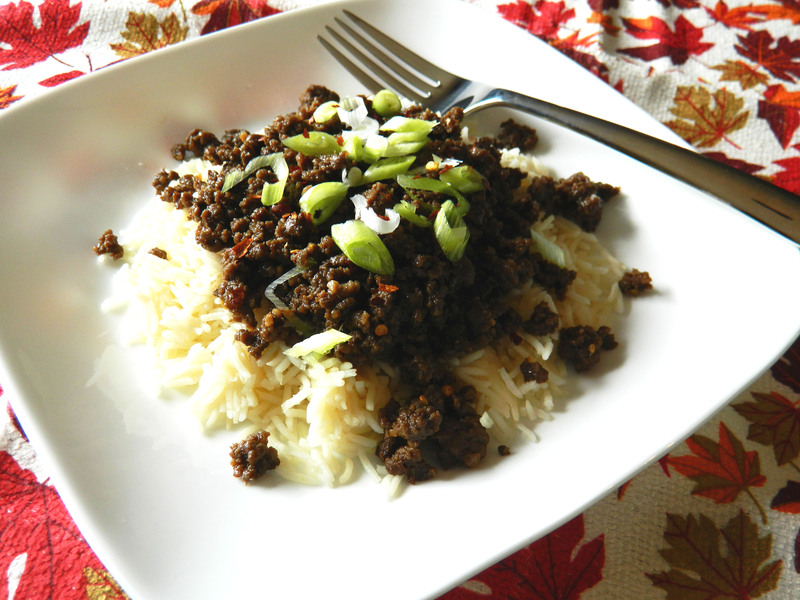 Serve on a bed of rice topped with the green onions.